What is in that watermelon? How many grams of sugar are in this gin and tonic I'm about to drink? While our smartphones have made it easy to research facts, capture images and navigate street maps, they have their shortcomings. If only they could reveal the inner secrets of objects in the physical world, too. and other items we use on a daily basis. "We designed SCiO to find applications where people have the most visceral connection to the world," said Dror Sharon, CEO and co-founder of Consumer Physics, the Israeli company behind SCiO. This tiny USB-shaped device fits in your hand and looks like something straight out of Star Trek - only it will tell you more information about the world around you than you ever wanted to know. SCiO uses spectrometry to read the "molecular fingerprint" of an object, shining near infrared light which stimulates the objects molecules and records their reactions. The product promises to be a "sixth sense" that will one day scan the chemical makeup of just about anything. It's currently limited to food, plants and medications with accompanying applications on iOS and Android to relay information. The plan is to one day expand SCiO's scanning powers to cosmetics, flora, soil, jewels, leather, plastics, oils, clothes, precious stones, rubber and even pets. The current iteration of SCiO can tell whether the watermelon you want to buy is ripe, what's in the pills your doctor prescribed, how many calories are in your meal, or whether your plant needs more water. A skeptic by nature, I had to test out the device for myself while on a recent trip to Israel. What I found was a truly mind-blowing piece of technology with possibilities that are as exciting as they are endless. SCiO helps make our smartphones less about separation from real life and more of a tool to interact with the physical world. 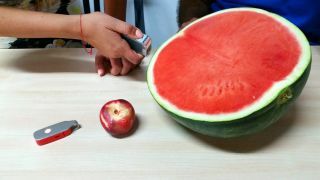 I pointed the SCiO scanner at a watermelon purchased before my appointment with the company and learned through its accompanying app the fruit's nutrient values and carbohydrate levels, right to the milligram. Next, I tested SCiO's ability to detect the difference between a branded Advil and a generic ibuprofen pill. This was a blind test and the device passed. SCiO correctly identified the chemical makeup of the unmarked white pill as ibuprofen. To use SCiO, a user holds the device between their index finger and thumb close to the object they want to scan. There's a button to press which shines a blue light onto whatever they're testing. It also works through some clear plastic wrappers. SCiO then transmits the data to the cloud using Bluetooth technology, and the sample is analyzed in a database of objects in a distant data center. When it gets a match - usually within seconds - it sends the results to the user's smartphone. The SCiO food app also measures fat, protein and overall quality - think ripeness, and spoilage for foods like cheeses, fruits, vegetables, sauces, salad dressings, cooking oils and more. The spectrometer figures out what the object is based on an infrared light that reflects back to the scanner.